Your ideal ALL-IN-ONE radio for garden use or on the road with FM, DAB +, internet radio and network streamer, as well as Spotify, Bluetooth and WLAN multiroom function! With multiroom capability. The compact smart radio with all modern features. CD, DAB +, Internet radio, FM, network audio and Bluetooth player, all within one little device! Now in the "To Go" version with built-in Li-Ion battery with up to 8 hours of battery life! A sound system that moves you! Driven is the CR-10ToGo! from an integrated amplifier with 5 watts, which delivers a rich sound experience. The volume can be controlled either via the multifunction knob on the front, on the remote control or via the smartphone app (UNDOK®). With the remote control can also be made adjustments in the bass and treble range (Your EQ) or you can choose between various presets like Normal, Centered, Jazz, Rock, Soundtrack, Classical, Pop and News. The built-in high quality 3 inch full-range speaker impresses along with a sophisticated resonant cavity structure by a rich, clearly differentiated sound that you would not expect from a compact radio. In addition to classic FM reception, the CR-10ToGo! also receives the new digital radio DAB +, which has become very common in Germany and sends in excellent CD quality. By far the largest amount of channels with over 25,000 stations from around the world, receives the Internet Tuner of CR-10ToGo!, which can be optionally operated with WLAN or LAN cable. In order to keep track of these channels, you can register your CR-10ToGo! on the Internet and easily manage your favorites. In addition there are up to 10 fixed presets, that can be conveniently stored and accessed via the remote control. Spotify - Music for all. The CR-10ToGo! has a native Spotify® support. The condition is that you use a Spotify® premium account. Simply select in your Spotify® app the CR-10ToGo! as an output device and stream music over your wireless network. You do not have a premium account? No problem, you play Spotify free easily using the integrated Bluetooth function. Even easier is pairing your smartphone, tablet PCs or computer with the new built-in Bluetooth® function. Simply select the CR-10ToGo! as an output device and play music easily without complicated configuration. The CR-10ToGo! only works as a Bluetooth receiver, but not as a Bluetooth transmitter. Thanks to its networking capability via WLAN or LAN and DLNA standard the CR-10ToGo! can connect to virtually any PC, music server or UPnP device (for example, NAS) and use it as a music source. Also, you may wirelessly play music from various mobile devices via the CR-10ToGo!. With the APP "UNDOK®" (available for iOS and Android), you can use your smartphone as a remote control for the CR-10ToGo! and select functions such as channel selection and digital sources. In addition, you can control the volume and the standby or manage multiroom groups by APP. You can play music from media players, iPods, smartphones or computers through the rear AUX input. * To set up a multi-room audio system, a base unit is not absolutely necessary. Multiple network speaker (SB-50, SB-100 or SB-200) can also be combined alone to a multiroom system. 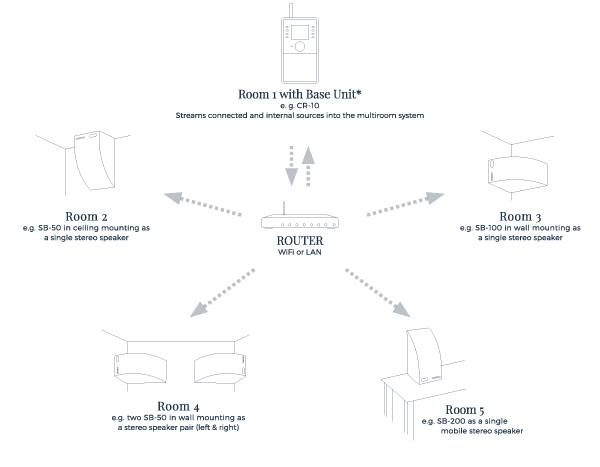 A maximum of 5 individual network devices (network loudspeakers or base units) can be combined into a multiroom system. Falls asleep with you and wakes you up. Choose comfortable with your remote a time from where the CR-10ToGo! automatically switches to standby mode, and it leaves your sleep. The CR-10ToGo! supports two alarm time, for example an alarm clock on weekdays and in the second for the weekend. You can switch on/off the alarm, set the time between daily, individual days, select weekends etc., the source to which you want to be woken up and adjust the volume.